old pros, but young compared to race car drivers in other circle and drag racing circuits. 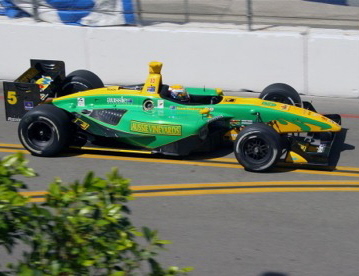 Tracy was supposed to give Bourdais a real test but was injured on Saturday during a practice run. His injury wasn’t serious but it may put him out of action for several months, and also out of the race for the series championship. Bourdais likes to win races and has won 24 of them in his career, but podium finishes are where the points lie and points add up to championships. Bourdais earned few points at the Las Vegas race due to an uncharacteristic crash that took him out of the race and let Will Power win. In a strong and dominating team performance, Bourdais was never in serious trouble this time and took his third straight Toyota Grand Prix of Long Beach title. Will Power, from Australia, won at Las Vegas in the season’s opening race. Cool as they come, nothing seemed to bother Sebastien Bourdais as he simply extended his lead. Fans and spectators told their stories about how the Grand Prix came to Long Beach and how many of them have never missed a race. They all have their favorite spots on the course and each year as the track is laid out; the “best seats” seem to change a bit. They speak glowingly about the race and that the entire area was rehabilitated and improved from the seedy nature before the Grand Prix came to town. Perhaps just as important is how the Toyota Grand Prix of Long Beach has helped to invigorate the racing series. Toyota’s influence cannot be understated and this car company’s impact has been immense in racing circles. The TGPLB can only be described as a large city that pops up near the ocean front for three days and then is gone again come Monday. It isn’t just the racing that holds center stage, although the roar of open wheel race cars and the cheering of the fans are the reason the race began those many years ago. The TGPLB also has room for those individuals only modestly interested in the racing outside. There are buildings full of merchants selling souvenirs and sponsors who are touting the superiority of their wares. The Long Beach Arena is full of activities and crews working on their cars. Walking is a must if you want to see everything that the TGPLB has to offer. 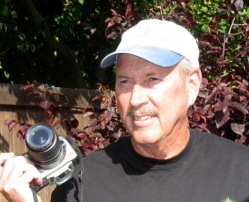 My feet gave out on me long before I could see the event in person and so this article is a cumulative effort by many people to record this event. Full time staff represents only a small part of those workers needed to put on the show. Part time employees and volunteers are needed in order to bring about a fascinating weekend of racing. The safety crews come from all over and they make sure that the injuries to racers and fans are kept to an absolute minimum, with zero injuries always being their goal. The crews that work on the cars and spot for the drivers are some of the most efficient and capable in all of motorsports racing. The drivers are kept in constant contact with their crew manager and crew chief, and computers on board the car tell driver and team every detail about the car and track. Tire pressure, gas consumption, heat and other factors are closely monitored. They know when to pit and for how long. 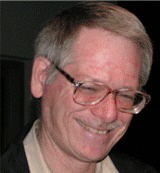 Beyond the computerized data is the ability and knowledge of the teams and driver. Good common horse sense and constant training and race experience lets them know what decision and strategy to take. Grand Prix racing is as much a skill of wits and knowledge as it is horsepower and brute strength. It is like a cat and mouse game of chess pitting power against finesse and often the best strategy gives victory, not necessarily the best car, driver and team. For sheer power watch drag and land speed racing. For dogged determination and stamina, watch the enduros, 24 hours of Le Mans and Sebring. For outright daredeviltry go to those NASCAR races or the Indy 500 and watch them fight for every inch of track until sweat, dust, grease and grime crowns the new champion. But if it’s cornering, turning, braking and maneuvering a fragile looking race car through a hopelessly tangled race course, then the TGPLB is your cup of tea. Watching the safety crews at work is interesting. They are experts in their field. Listening to the team manager coach the driver through the course is absolute magic. From a distance it looks rather tame. It’s hard to pass except at certain spots and the drivers know how to protect themselves. The race gets very interesting after a crash, and there were three of them in this race. Mario Dominguez backed into turn number 9 at the beginning of the race. 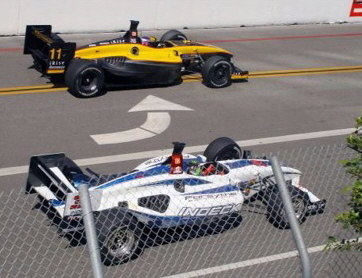 Simon Pagenaud crashed near the middle of the race, and Alex Figge crashed into that unforgiving turn number 9 with 15 minutes left in the race. A crash brings out the yellow flag and slows the cars down considerably, sometimes to a crawl. It brings a respite to those in the rear of the race, that are under great pressure to find a way to move back up closer to the leader. In this case, that meant Bourdais and his ever-greater time leads. Three times Bourdais charged out to huge leads and three times the yellow flags slowed him down and allowed the pack to erase his leads. Cool as they come, nothing seemed to bother Sebastien Bourdais as he simply extended his lead after the yellow flags were lifted. Once he dropped back into 2nd place, but it seemed as if he was merely resting there until it was time to take charge again. Even other team managers mentioned that to the reporters. On this day they were jockeying for 2nd and 3rd and a podium finish. 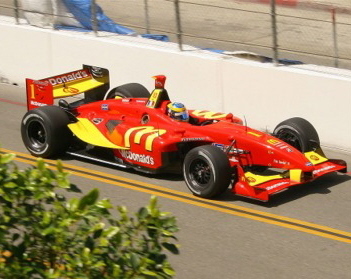 Oriol Servia, taking over for injured Paul Tracy, gave Bourdais a good run, but settled for 2nd. A strong finish for the man who wants to prove that he can race full time. Promising Will Power moved into the 3rd spot through daring and inventive driving and proved that even when the master is in control of the race, that he can still be a threat. Sebastien said, “this is one of my best races, and all the credit goes to the crew.” He was totally believable and very suave, though this is probably not the first time he has said that after such a dominating performance. Servia was more forthright in saying, “how many times must I show I’m ready to go (full time).” Part of the problem may be Servia’s way of expressing himself in English but you got his meaning when he added, “I did my job today, I knew exactly what Paul (Tracy) would have wanted to do.” Servia will drive himself into a starting job someday soon. It was hard to get a quote from Power, but it wasn’t necessary. Power was excited by his 1st and 3rd place finishes in his last two races and what I thought he was saying was that he wanted more, much more, and it was only a matter of time before his team and his experiences allowed him to go much further. Justin Wilson placed 4th, just missing the podium (top three finishers). “Each day we are getting better as a team and I’m very pleased with our 4th place finish. We’ll get a podium finish in the next race,” he said. Paul Tracy get passed by Katherine Legge #11. 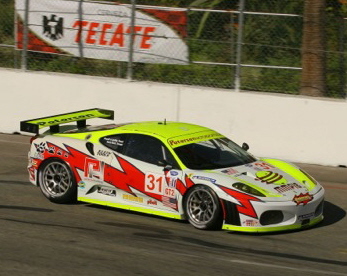 Peterson Motorsports Ferrari at Long Beach after a crash at Las Vegas. The weather was overcast and sometimes breezy and cool, at other times warm and sunny. This was typical weather for the month of April in Long Beach. The city and fans love this race. None of the promoters, race teams or sponsors seemed to say otherwise. There are 14 more races to go in the Champ Car open wheel series and several drivers have their eyes on upsetting Bourdais. It may happen and that’s why they run the races because nothing in racing is ever certain. The Championship will go to the team with a determined strategy and cool nerves. The question is whether the youngsters will gain those talents quickly enough to take away Bourdais quest for a fourth successive Champ Car championship. Gone Racin’ is at [email protected]. This story was written with many available resources.